Author's address: School of Audiology and Speech Sciences, University of British Columbia, 5804 Fairview Crescent, Vancouver, B.C., Canada V6T 1W5. de Villiers, J. H. & de Villiers, P. A. (1978). Language acquisition. Cambridge, Mass. : Harvard University Press. Fry, D. B. (1966). The development of the phonological system in the normal and the deaf child. In Smith, F. & Miller, G. A. (eds), The genesis of language: a psycholinguistic approach, Cambridge, Mass. : M.I.T. Lenneberg, E. H., Rebelsky, G. F. & Nichols, I. A. (1965). 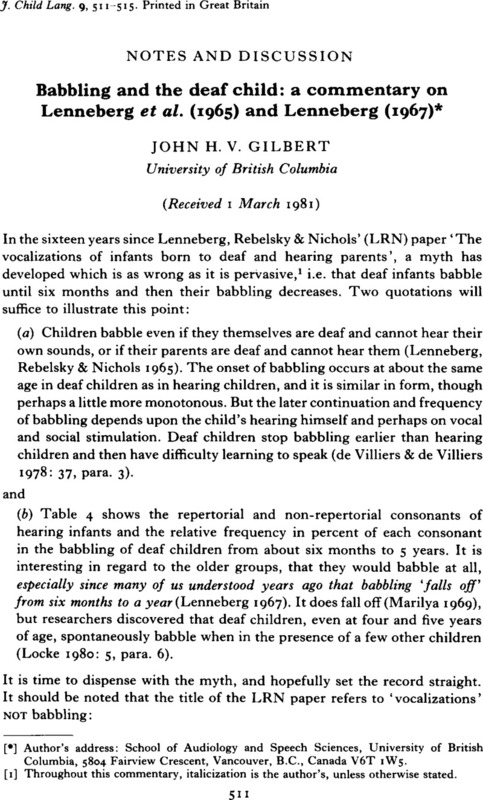 The vocalizations of infants born to deaf and to hearing parents. HumDev 8. 23–37. Locke, J. F. (1980). Mechanisms of phonological development in children: maintenance, learning and loss. Paper presented in the general session of the 16th Regional Meeting of the Chicago Linguistic Society. Oiler, D. K. (1977). Infant vocalizations and the development of speech. Paper presented at the University of Wisconsin at Milwaukee Conference on Early Intervention with Infants and Young Children. Whetnall, E. & Fry, D. B. (1964). The deaf child. London: Heinemann.